As yard sale season approaches, I am continually asked for my tips and tricks of the Garage Sale Guru trade, so I thought I’d break down the process of what I look for specifically in a furniture purchase. We all want our house to look its best, yet often, our preconceived notion of how much it will cost to turn our house into a haven stands in the way of doing much about it. Our minds hold us hostage by our budget, when that doesn’t have to be true. With all the products on the market for Do it Yourself projects, second hand is the way to go. I look around at every room in our home and there are only three pieces of furniture that we have bought new, as in, from a real store. In fact, the more I peruse each room, the more I realize that my way of life is buying all our furniture second hand. For case good furniture, the quality of past decade’s craftsmanship just can’t be matched these days. Living in the furniture capital of the world, and learning a lot about pricing of furniture and how brands manufacturer different lines, I lean even more to buying used since the quality is hard to match. With just a few simple tried and true ideas for buying second hand furniture from both thrift stores and yard sales, you may well be on your way to updating your home for pennies on the dollar. Often that translates to “you aren’t looking looking hard enough or you don’t know where to look.” Your best bets are thrift stores and yard sales, but if they aren’t your thing, then try Auctions (everyone should go at least once), Flea Markets, Craig’s List, or the classified ads in the newspaper. Post it on your facebook. Tell your friends that you are looking for a “round wood table.” You never know who is trying to get rid of one, and it certainly doesn’t hurt to ask. Whether you have children or not, this is key. Give it a wiggle. Lean into the piece of furniture and put pressure on it. If it really moves, there may be more work involved with fixing it up. Pull out the drawers, open the cabinets, sit on the chair, sit on the table. Imagine all the things that a kid would do with that piece of furniture. It will help you see how sturdy it is. If it’s not sturdy, typically that means I can negotiate a bit more with the price (and I don’t mind that.) I don’t want you to be surprised when you get your piece home and you are saddened because the drawer has a hole in it. It’s up to you to do the inspection first before you buy. I have a sensitive nose and this tip is crucial for me. The smell of a piece tells me a lot about it’s history. It lets me know if it’s been in a smoke filled house ever. I can’t buy anything that has, even with some of the cover up paints that are on the market. It tells me if there’s been any water damage. It also tells me the approximate age. Wood seems to have different smells as they age. Yes, this is also the most embarrassing step. I have a casual, “get a good sniff without anyone looking”, technique down to a science, but when I am set on buying something, I will really do a thorough smell test. Prime example, the featured chair of this post. I just bought it this week at Goodwill. I literally smelled the seat cushion, the back of the chair,and the sides. I was even embarrassed being me. But it was worth the raised eyebrows because I knew I would be investing in reupholstering that piece, and didn’t want any disappointments later on. What caught my eye with this chair were the gorgeous lines and decorative elements of the chair. In the next month, I am painting my all green great room a soft shade of blue-ish gray, and I am looking for some more French Country Cottage furniture. I knew that the lines of this chair were gorgeous. I immediately envisioned a beautiful green, white, blue fabric on it, after I freshened up the paint with some antique white. It was solid. I sat in it and bounced around a bit, so it passed the Kid test. I smelled it, and it passed the Smell Test. It was solid wood, I knew it easily passed the Paint Test. The lines and cut of the chair spoke for themselves, so it was a sale. 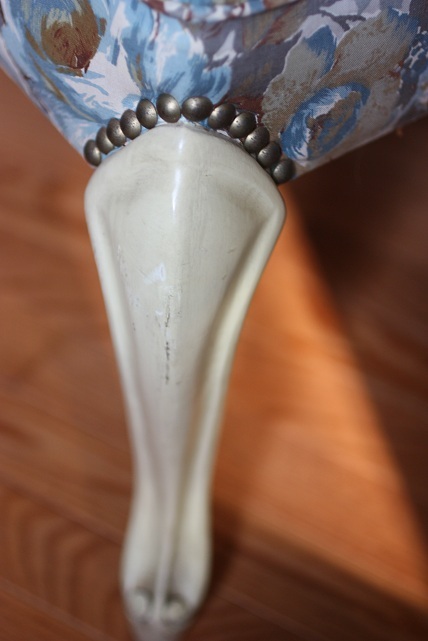 Ask Yourself: Can you Paint it, Add to it or Reupholster it? Forget the outside appearance, old fabric or that nasty wood and horrid paint job. Almost anything can be painted to suit your needs and the change is nearly always easier than you think. I’m on a “paint all my furniture white” kick. It needs to stop, but the beauty of that problem is that it’s only another paint can away from changing it up. Remember that all hard wear can be easily replaced, so if there are broken knobs or ugly ones, it’s such a simple fix and can transform the look of a piece in dramatic ways. If you want more detail, you can always add wood elements that are sold inexpensively at Home Depot or Lowes. Really think outside the box on this one. I have passed on quite a few pieces that I now regret (but I guess they would still be sitting unpainted anyhow, since I have a bit of a backlog on my painting projects. 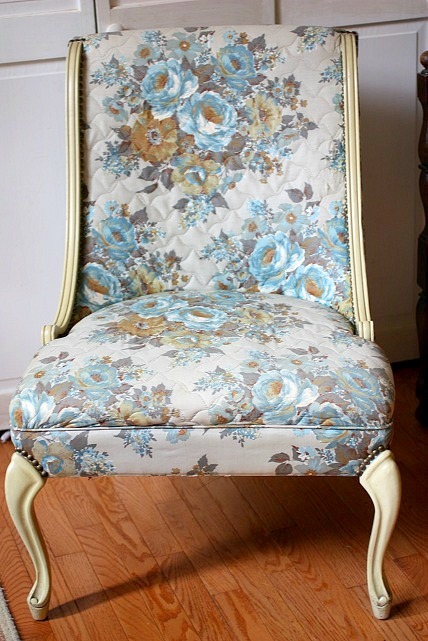 ;)) I tend to steer clear of older upholstery jobs, but this one, I knew was quite the find. I examined it carefully for about 20 minutes looking for any “critter signs,” then I came home and immediately sprayed it down. Since I can only do simple DIY seat cushion redo’s, I am going to look for an inexpensive person to take on my new fabric, but it will be worth the extra money in the long run. The key to really getting the best value from buying second hand is by negotiating. I know, I know. It’s scary at first, but read my post: Save a lot of money by learning the art of negotiating. Negotiating, doesn’t have to be nerve wracking. It’s just respectfully asking if they are firm on the price. My key bit of advice is BE CHARMING, not cheap. I rarely fail in negotiating, but this time I did (with a good reason.) The chair had already been marked down 50%. Now trust me, I tried to negotiate further by being nicely charming and pointing out the reasons on the chair it should be less, but they said no. It’s always worth asking if they would consider taking a bit more off because more times than not, they say “Yes.” The employee shared they had just marked it from $35 (WAY TOO HIGH) to $17.50 (still more than I like to pay but I have a Goodwill discount card, so it was $15, which is a great deal for this chair), and they wouldn’t consider going down for another week. I know many of you are probably wondering what are the three new pieces we bought. After purchasing second hand matching antique beds for our daughter’s room, I went ahead and decided they would not handle the wear and tear of the next ten years. So, without spending more money, we bought two “Pottery Barn” look alikes from either Sam’s Club or Cosco (can’t remember). The only other new purchase was a down sofa, but again, it was a Furniture Market Sample that was 80% off, so really, it was second hand pricing. Honestly, that sofa is too big for our great room, and I am now on the hunt for a smaller sofa that will give me the ability to recreate the Pottery Barn white slipper cover look. There was one sofa for $25 at a yard sale last week, and I passed on it. Now I am regretting that decision a bit. A great sofa may be a larger price point, but I need to put that amount in the budget, since I’ve been looking for a year and I am VERY picky with second hand upholstered furniture ever since the “bed bug” scare. For me, a new sofa may be worth the investment, but I haven’t given up yet. So there is my extent of new furniture. Honestly, I get all excited just thinking of the possibilities you may have if you have never shopped this way before. But this post is getting long, so maybe you can share some of your tried and true tips for buying second hand furniture. What is your favorite furniture find? Did you have to re-purpose it? Those are great tips! The only thing I’d add is to look for signs of bed bugs on any upholstered piece you find. You can Google how to do that, but bed bugs are the last thing a thrifter wants to bring home, especially since they’ve made a resurgence here in the States. A blogger friend of mine brought bed bugs home with her after a thrifting purchase. Scary stuff! Amanda – I was going to address that issue and that thought – oh my, that’s a whole separate post, BUT that is why I am very picky. I know that many thrift stores do take care of that first before they sell, but it’s something to be aware of for sure. @Jen, what do you use to spray down your purchases? It depends on what it is. If it’s something that bleach won’t wreck, I use a daily cleaner with a bit of bleach in it. If it’s upholstery, I have a fabric cleaner. Otherwise, just basic cleaners that I purchase at the store. Great post! I didn’t know there was such a thing as a Goodwill discount card. About bed bugs…I thought Goodwill and Salvation Army fumigated their furniture before putting it on the floor. Does anyone know if this has changed? I, too, have a fear of bringing something home that I didn’t plan on. This is such a helpful article – we love buying used furniture but are always nervous about what we are buying. I love secondhand furniture! Thanks for this post! GOOD stuff! Jen, what do you use to spray the furniture? Our state is having terrible problems with bedbugs so my former habit of buying used upholstered furniture has halted. Is the spray guaranteed? Thanks! My source for used furniture is freecycle. I’ve gotten some amazing things from there. The best piece I got is a desk. I needed a tabletop surface to use as a cutting table for my sewing room. I asked on freecycle for a table or something at least 60 inches long and 36 inches wide. I was offered an office desk with those exact dimensions! It’s sold wood, has 5 drawers that glide super smoothly, and is the most beautiful color. The only flaw is that the finish got messed up on the top. But that spot is under my cutting mat, so it’s hidden all the time anyway! I also had someone make me a custom coffee table after a freecycle request. He knew I wanted it for the kids to use, so he made it extra sturdy and rounded all the corners for safety. My kids jump on it and it doesn’t budge! Sometimes on freecycle, all you get is junk, but these were two that blew me away! I had to painfully pass up a beautiful vintage piece yesterday at our Goodwill. It seemed like it was in very good shape, and I SO wanted (okay..want) that piece, but I couldn’t justify buying it. Well, I couldn’t get it home anyhow. It’s BEAUTIFUL though. Hate to pass it up! I am a serial second hand shopper-that said, I’m no expert, so this was so helpful! How does one go about getting a discount card from Goodwill? How did you get yours? Never heard of that, and am just curious. I think that every GW is different, not all have them. Ours does because they do not offer special discount days, or certain discounts off of a “number or color” like other stores do. I would just ask what specials they have and they will let you know. We have six GW’s in our area. They don’t do discount cards that I’ve heard of, but their websites list which stores are offering which discounts each day of the week. If your GW has a website, you might try checking that. I’m currently stalking my GW for a computer monitor and a dresser to turn into a vanity in the bathroom. Sometimes, if you have a good quality solid wood table or dresser top that has been gouged or damaged, you can flip the top and finish the underside of it. It doesn’t always work, but it’s paid off for me a couple of times. My favorite- the smell test! My favorite was a desk I found sitting by the garbage. My family thought I was nuts until they saw how I transformed it. AS WE SPEAK, I am in the process of painting a nondescript wood “dresser” to convert it to CD storage. I found a short 4-drawer ‘something’ (too narrow to be a dresser; too many drawers to be a nightstand) that is all wood. I am painting the outside off-white, and the top & drawer fronts a dark to navy blue. Fun! We are frequent garage sale shoppers and our best find was a table that was behind the garage at a sale. It appears to be an old table that somebody cut the legs down to coffee table size. It had been repainted many times and had been out in the weather so the paint had worn off naturally. The wood was not damaged and was still sturdy. There is a drawer in the front where my grandchildren keep their art supplies and it is just the right height for a craft table. When they are not here I put a cloth on it and some plants and it is my living room coffee table. Everybody asks where I got it. Our house is decorated old farm house style so it fits in perfectly. Oh did I mention it was FREE!!! I am always seeing furniture I would like to buy but don’t because of the bedbug issue. I am an avid thrift store shopper…yesterday I scored a beautiful St. John Knits jacket which probably sold for a $1,000+ dollars for $3.00…and see things that I would love to paint but don’t because of my fear of bedbugs….which could also be on the clothes and other items I buy! Maybe I should not be shopping in thrift stores!!! @Sarah Vick, I feel the same way. Always buy tons of clothes at thrift store or rummage sales or other decorative stuff but never any furniture or linens because of my fear of bed bugs (and lice). But go figure these critters can make their way home on clothes, too. Here’s what I do though for used clothes, I immediately seal the bag up. Then, when I get home transfer it to a “cleaner” bag if the thrift store uses recycled bags. Then, throw the clothing sealed in the bag into my deep freezer for 3-7 days. Then, I wash in hottest temp allowed for that fabric and dry on high heat if it can be. Keep in mind, some delicate stuff or those with embellishments can’t take the high temps but will do okay in freezing temps. So far this method seems to have worked for me the last 7 years. Knock on wood. LOL. Sometimes trying on used clothes is a risk, too but I just grin and bear it. And, I have been lucky so far. I only try things on that look and smell clean or that still have tags on them. Thanks so much for this, Jen! My bf just bought a condo and is in the slow process of transforming from ‘college dorm style’ to something a bit more permanent. He’s not much of a shopper and is not a fan of spending money unnecessarily, so I’ll probably be pre-screening everything (which works for me since we may be sharing it some day!). I don’t normally shop on Craigslist, but started browsing last night and found some fabulous deals! Can’t wait to hit the resale shops! Too funny, but that chair has exactly the same print and color as my Mom’s bridesmaid’s dresses did 55 years ago this June! 🙂 No quilting though (or wooden legs!). Made me smile! We’ve gotten a fair amount of hand-me-down furniture (including a lovely piano) from family and purchased a dining table and chair set at an estate auction (someone we know well). Haven’t delved into the realm of second-hand furniture at thrift stores yet (most of the stuff I’ve seen I don’t want anyway) but I am definitely interested in trying it in the future! Something I always have trouble with is how to get furniture home from a thrift store. Sometimes you luck out and find something at a place close enough to lug it home with a friend’s help, but for those slightly further places, it doesn’t seem worth getting a great deal on a new table and then needing to spend the same price to rent a truck to get it home. Any tips? Miranda – don’t pass up those pieces you find because you can’t get them home. Most specialty and even chain thrift stores either offer delivery (usually for a fee) or have names of movers. I’d check with them – our shop offers local deliver for $25 – even customers with trucks pay us to deliver so they don’t have to do the lifting and moving. I love your tips. I don’t know how to do appolstery, so I haven’t ventured into that kind of furniture. Plus, husband won’t take anything that might have had dogs or cats sitting on it because of allergies, and the bed bug thing scares me. But I do LOVE to paint things. I would love to find a new kitchen table to paint, as mine is getting old. Wish I lived close to you and could go to an auction or yard sale with you. Re: bedbugs…my 75 yr. old uncle got a serious infestation of bedbugs after buying a floor model sofa from a very reputable furniture store NEW. He didn’t have a clue and was not allergic to the bites so only noticed it until he saw some clambering up his leg prosthetic. Then my cousins filled him in. He had a hard time even finding someone who would haul the couch to the dump it was so badly infested. So I think buyer beware for any purchases anywhere! By the way….I REALLY wished you could have picked that coffee table up for me last week. It is exactly what I’m hoping to find!!! Will keep looking!!! That is so crazy odd that he got them from a NEW store. WOW! Yes, so true on the buyer beware because I’d never think something new would have a chance. Oh, so sorry about the coffee table. She was a beauty, wasn’t she? Some one who saw my picture and lived in the area went and bought it. 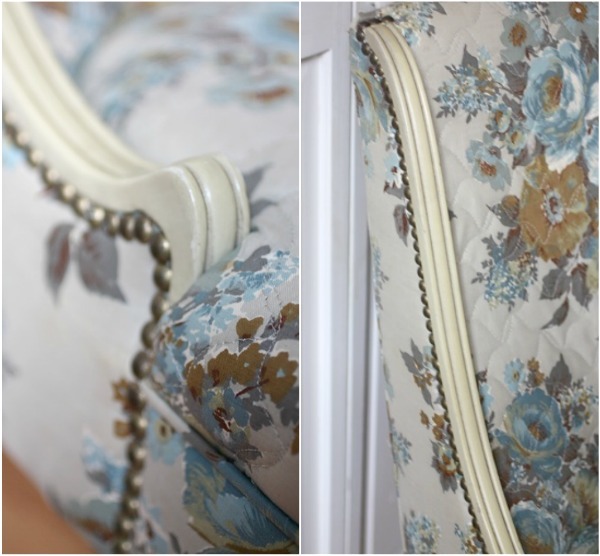 Jen, have you tried painting upholstered furniture with the new fabric painting medium? Believe it or not, I spray painted old cushions and a chair using plain old spray paint. I did it on outdoor furniture and it weathered the entire winter. I couldn’t believe it. I was testing it out this past season, BUT it does feel very stiff, not cozy at all, so I am excited to use the new medium. I was thinking that even adding something into the regular paint may work as well. If my cushions held up to spray paint, I can only imagine this being great. Amazing tips you have shared for buying the second hand furniture and save money. I think it will really help you while buying second hand furniture if followed properly.